Includes detachable searchlight that can be used as a torch. Some missions require intervention from the sky! 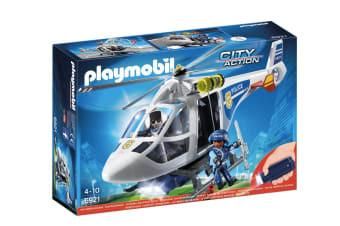 From their helicopter seats, the police officers have a perfect overview of the local road network, complexes and parks – even at night, where they can simply make use of the bottom LED searchlight! From their bird’s eye view, they are able to respond to obstructions of peace quickly, efficiently and at all times. 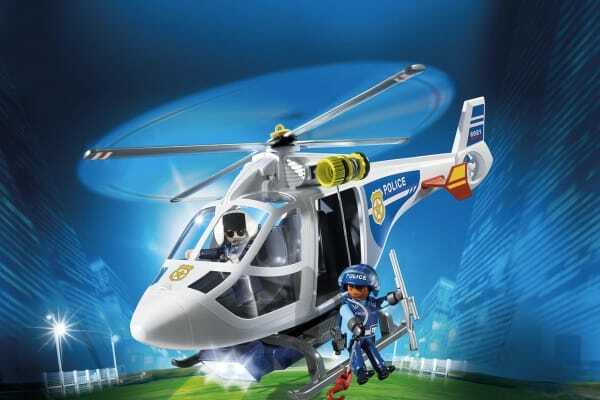 The helicopter is especially handy on bigger missions, where it can be used to catch even the meanest criminals off guard, and by sliding down the rope winch, the police officers can perform extraordinarily action-packed arrests! As a super cool twist, you can detach the police helicopter’s searchlight and use it as a small torch.